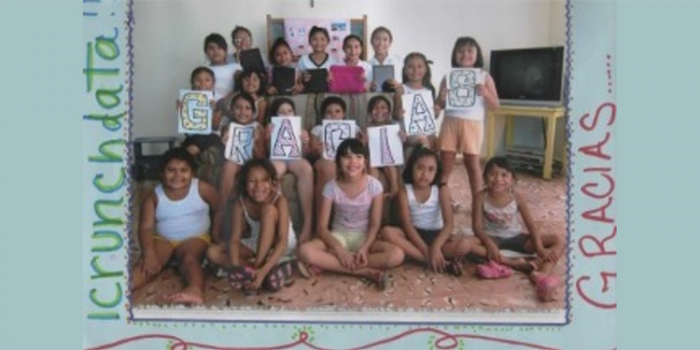 icrunchdata is continuing to deliver technology resources, education and iPads to Nueva Vida, an all-girls education center in Merida, Yucatan Mexico. 42% of Mexico’s population lives below the poverty line and the lack of educational resources is the main factor that keeps the percentage at this level. icrunchdata works with an afternoon, education center located on the south side of Merida, in the State of the Yucatan, to broaden the minds and worlds of the students that attend this center. Nueva Vida (New Life) is a learning center attended by girls’ ages 6 to 12 in the afternoon once they have finished their morning classes in the public schools. Outside the walls of the center is a world with families caught in the cycle of poverty but inside is a place full of laughter, hope and dreams. The girls come from families that are living well below the poverty line and have reached out to Nueva Vida for help in educating their children. The center provides a structured and safe learning environment with programs designed to assist the students with homework support, tutoring and enrichment classes in English, art & music, computers, cooking, crafts and sports. The Director of Nueva Vida, Tricia Pipkin, took over this role in 2012 after spending her career as an elementary school teacher in Colorado. She recently visited with icrunchdata Co-founder to discuss the unique challenges that her and her 6 staff tackle each day and how just the introduction of 2 used laptops and the internet has improved the girl’s level of awareness that there is a wider world out there. Q: What are your main goals for the education center and for the girls? Q: What are your thoughts on how technology and iPads can help you reach your goals sooner? icrunchdata’s mission is to help Tricia and the staff of Nueva Vida continue to introduce the students to a bigger world of options with technology in the classrooms. We are thrilled, humbled and overwhelmed to recently deliver iPads to the school. There were cheers and chills and we left with the confirmation that there is hope everywhere, it sometimes just needs a little bit of help.